Shylah Hart was looking forward to sharing the views of her fellow students in her new role as rural student trustee at the Limestone District School Board. Photo by Adam Bramburger. Following their election last month, several fresh faces will be sitting around the Limestone District School Board table in December. By then, Shylah Hart should be quite comfortable in her seat. Days before trustee candidates learned their fate in the fall election, the NDSS Grade 12 student was selected as the board’s new rural student trustee by students’ council presidents across the board, replacing former NDSS student Ayrison Haynes who has moved to Alberta. Hart said she’d always been interested in leadership roles and had been encouraged to apply for the position by one of her teachers. She had to write an application to the board, then give a two-minute to her fellow student leaders about why she felt she’d be a good representative for them. While she was the only declared candidate, there was a chance she wouldn’t receive support. Hart said she believes strongly in the value of having student input in the education system. Hart said she felt she could be a good person to offer that feedback because she’s always been comfortable talking with adults and communicating to her peers. She has also been active in student and community events, taking part in concert band, cheer team, and science tutoring at NDSS as well as jamborees and music festivals outside the school. “I’m generally a person you can come to with concerns or questions. Opinion aside, I can take what someone says to me and pass it along pretty efficiently,” she said. 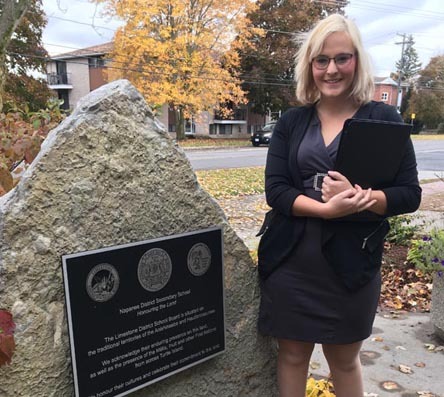 In her new role, Hart has a massive geographic area to cover with NDSS, Ernestown, Granite Ridge, North Addington, and Sydenham students among her constituents. There are ways to pull the schools together, however. Through the inter-school council that elected her, Hart has contact information for co-presidents of each school. Their meetings will also provide a clearing house of information on a monthly basis. Then, there’s electronic communications and regular dialogue. Hart’s first meeting with the outgoing board was two weeks ago. Her first impression was that trustees and administration were “very welcoming,” and they treated her and urban student trustee Sean Kim as adults. The student trustees are allowed to give their opinion on motions and in discussions at regular meetings and they are also encouraged to cast votes, however their votes are not tallied. Asked about her priorities, Hart said she’d first like to get a feel of the role and where students stand. Safe schools where everyone feels accepted and included is one pillar she believes in. Already, Hart and Kim have discussed encouraging the board to ensure the Ophea healthy eating program is adopted in all of the board’s high schools. Otherwise, she’s simply encouraging students to talk with her. Being a student trustee also provides students an incredible opportunity to learn about governance, management, and politics. Hart said she’s interested in the learning aspect of her role and what opportunities it may open for her. Currently, she plans to pursue forensic science in post-secondary education, but she has her mind open to where politics and civic engagement might fit into her future. This past weekend, she had an engaging educational experience at the Ontario Student Trustees Association’s fall general meeting in Toronto. Two key note presentations Hart really enjoyed were one by Education Quality and Accountability Office (EQAO) chief administrative officer on Norah Marsh on how standardized testing may change and one by Halton Catholic District School Board education director Patrick Daly on budgeting. The weekend, she said, really underscored that student trustees collectively have a big responsibility. “You’re advocating not just for yourself or just your school, you’re advocating for everyone… and it’s not just from Napanee to Kingston, it’s for everyone in Ontario,” she said, choosing a quote from Daly that resonated.